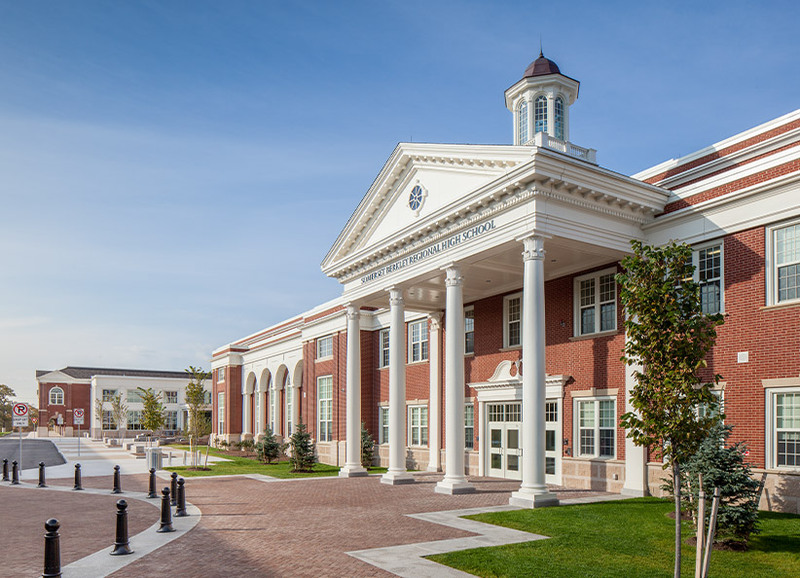 The new Somerset Berkley Regional High School project replaced a 1936 historic high school building located “on top of the hill” along County Street (Route 138), the main thoroughfare traveling through the Town of Somerset. The original 1936 building, considered by residents as the most significant piece of architecture in Town, included many characteristic features of Greek Revival and Federal / Georgian (Colonial) Revival style architecture. The design of the modern 21st Century educational facility respects the historic nature of the Greek Revival and Federal / Georgian (Colonial) Revival style architecture by including exterior detailing such as; a pedimented portico, classical entry columns, dentil molding, classically proportioned window systems, cupola and a swan’s neck split pediment above the main entrance. The reference to the existing building’s traditional architecture was overwhelmingly approved by the residents. The interior design, although detailed with wood crown molding, classical columns and pilasters, displays a significantly more high-tech, technology driven, very progressive educational facility that showcases the district’s robust fine arts and performing arts programs. The new building is designed to achieve a LEED silver rating and includes many green design strategies such as; an energy efficient building envelope, high performance windows, rainwater collection system, high efficiency mechanical and lighting systems, optimum acoustics within instructional classrooms, low flow toilet fixtures, among many others.